NIHRAC provides volunteer emergency communications support to the National Institutes of Health. 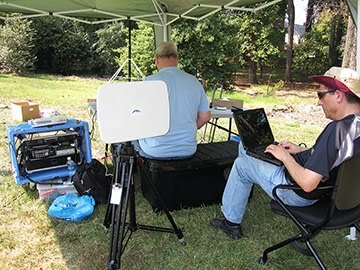 This emergency communications support capability is sponsored by and collaborates with the NIH Division of Emergency Preparedness and Coordination (DEPC) of the NIH Office of Research Services (ORS) and the National Library of Medicine's Disaster Information Management Research Center (DIMRC). The emergency communications support function of NIHRAC also benefits from and provides support to the emergency communications services of the Bethesda Partnership Emergency Preparedness Partnership. The NIHRAC is an active contributor to BHEPP, and enabled the development of the BMERS emergency email system. Volunteer radio operators trained on emergency communications. HF transceivers (base stations and portable). VHF transceivers (base stations and portable). BMERS (Winlink2000) radio stations (portable and base). A variety of HF and VHF antennas (roof mounted and portable). Spare radio equipment, tools, and supplies. 2 meter and 70 cm FM repeaters. Access to BHEPPnet, a dedicated laser-based network that joins BHEPP hospital's Emergency Operations Centers. EchoLink connectivity for Internet-based voice communications. Access to the NIH campus network. NIHRAC volunteers during a mobile emergency communications exercise at the NIH Campus (2010). To contact NIHRAC, send email to "info @ nihrac.org" or see our Contact Us page for additional options.